The Fabienne Colas Foundation is launching a call for applications for its brand new program “Youth and Diversity”, in collaboration with the Montreal International Black Film Festival. 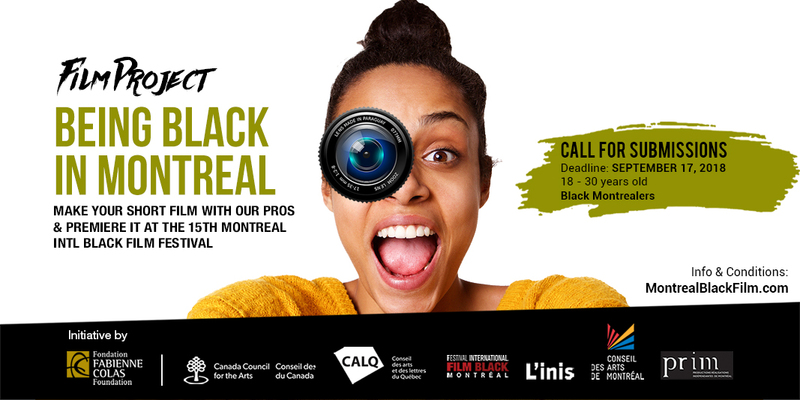 This program offers professional mentorship in the audiovisual production of a short film with the theme of “Being Black in Montreal.” 10 young, promising filmmakers will be guided through the many steps in audiovisual production (screenwriting, directing, editing, post-production, etc. ), and will create a documentary short (maximum 10 minutes). This process will be carried out under the professional tutelage of an industry professional with professional equipment from Inis (l’Institut national de l’image et du son) and PRIM (Productions Réalisations Indépendantes de Montréal). Filmmakers will address the issue of social integration of people from black communities in Montreal through film. The program addresses young Montrealers between 18 and 30, who are from black communities and have a passion for cinema. Potential candidates have a dream to work in the audiovisual field but have not yet had the opportunity, due to social, economic and/or cultural reasons. Be between 18 and 30 (included) on the date of application..
Be from a black community. Have demonstrated an interest in the audiovisual field and documentary filmmaking. Have concrete career-oriented plans in the audiovisual field. Demonstrate motivation for the program. Be available for activities related to the program, particularly from September 2018 to June 2019. Live in the greater Montreal area. Submit a video or film you made in a non-professional setting (short film, clip, video, etc.). Submit a concrete documentary project that fits the program theme (250 words). Have a good command of written or spoken French (enough to be able to follow the training & fully benefit from the mentorship provided). People who have already created, completed or directed professional videos or films are not eligible. The films can be made in French or English, but each selected candidate will need sufficient knowledge in French in order to be able to follow all trainings. Hurry and send in your application before September 17, 2018, by filling out the form below, to have the chance to participate in this program. Only selected candidates will be contacted. The FCF program, “Youth and Diversity” offers training, professional mentors and a visibility platform in the audiovisual field to 10 young, promising filmmakers from black communities. The program’s theme is Being Black in Montreal, and its goal is to cultivate future audiovisual talent in black communities, to those who haven’t had the chance to receive in-depth professional training in the field. Be available for activities related to the program, particularly from September 2018 February 2019. Submit a concrete documentary project that fits the program theme (100 words). Have a good command of written or spoken French (enough to be able to follow the training). Fill out the online application form: link. The organization will make a pre-selection of all completed applications received according to the previously outlined criteria. Pre-selected applications will be submitted to a selection committee who will choose the 10 program participants. The choice of the organization and the selection committee will be made at their discretion. They will not have to provide justification or motivation, and cannot under any circumstance be the subject of a complaint. The Organization reserves the right to select fewer participants than expected. 1. Overall schedule of the 2018 edition of the “Youth and Diversity” program. NB: a detailed schedule will be given to selected participants. Filmmakers participating in the program are required to participate in scheduled events. 2. Young filmmakers agree to follow technical guidelines (length, format, etc.) and the program’s “Being Black in Montreal” theme. 3. Young filmmakers have full creative and editorial licence over their film and will be the writer and director. However, he or she agrees to assign the international rights for an unlimited time to the organization (and its designated partners), who could, in whole or in part, distribute the film through any existing medium, submit it to different festivals, make it available for free and/or sell it through broadcasting platforms, if applicable. 4. The filmmaker is responsible for transportation fees and meals throughout the program. All selected competitors must sign a participation agreement stipulating an authorization to distribute, transfer rights and that their image may be used by sponsors, financial partners, the organizer and the show’s broadcaster, compliance with program rules, and that all work is unpaid. Any competitor who refuses to sign the documents before the prescribed deadline will be disqualified or ineligible to participate. Individual guidance, in the form of a mentorship, is offered by L’INIS throughout the creation of the films. Professional material is made available for film production. Young filmmakers will share their experience with the public. All films will later be broadcast on the Internet by the organization (social media, Internet sites and MIBFF Youtube channel). Awards will be allocated at the end of the program. By applying for the “Youth and Diversity” program, the candidate and his or her eligible beneficiaries tacitly accept the present set of rules without reservation. Any candidates who violates of one or more of the conditions for selection stipulated in the present document will be denied the opportunity to continue participating in the selection.